1 The FICO Score provided under the offer described here uses a proprietary credit model designed by FICO. 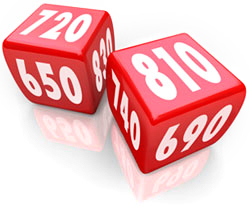 There are numerous other credit scores and models in the marketplace, including different FICO Scores. Please keep in mind third parties may use a different credit score when evaluating your creditworthiness. Also, third parties will take into consideration items other than your credit score or information found in your credit file, such as your income. Monitor your FICO score each month. Receive two reasons why your credit score is what it is. Learn about the factors that may impact your credit score. Watch for your invite in Online Banking under Account Manager in your Inbox messages. Simply select that link and follow the instructions to Opt-in. You'll need to agree to the Terms and Conditions presented. You'll then begin receiving your credit score on a monthly basis. Need Help? Contact us at 800.328.8797 or email us. * DCU's Free FICO Score Product Terms and Conditions. Why did DCU choose Equifax for this product? Equifax has a long and well-established history of recording credit information. DCU's goal in offering this product was to provide the most useful information to our members free of cost, allowing our members to better achieve their financial goals. Equifax's reliability and quality of information made them the perfect choice for providing this product to our members. Why is DCU offering this product? Simply put, for the benefit of our members. Credit scores have become increasingly more important as time goes on. DCU believes that regular and easy access to credit information is vital to financial health, and through this product, we are able to provide that information at no cost to our members. Can I get scores from all three bureaus? At this time, unfortunately not. However, under federal law you are entitled to a free credit report once per year from all three major credit bureaus. While this report will not contain your score, it is vital to review this information regularly for accuracy and to watch for any fraudulent activity. You can find all three credit bureaus' contact information on our StreetWise Credit Reports page or at annualcreditreport.com. How do I sign up (opt in) for this product? Will anyone else have access to this information? This information will be displayed in Online Banking which is secure and accessible to you via a password. No one else will have access unless you have given them your password to access your account. Are there other services associated with this that I will be charged for? Although this information is provided completely free of charge, you will have the option to purchase additional products directly through Equifax such as alerts and identity theft protection options. Can I get access to my full credit report? Not through this product, but under federal law you are entitled to a free credit report once per year from all three major credit bureaus. While this report will not contain your score, it is vital to review this information regularly for accuracy and to watch for any fraudulent activity. You can find all three credit bureaus' contact information on our StreetWise Credit Reports page or at annualcreditreport.com. I had a different score recently. Why is my score changing month to month? Along with your credit score, you may receive up to two factors that will help you better understand your credit score. You can use these factors to help you determine how your financial behavior impacts your creditworthiness. Credit scores can change for any number of reasons, including opening or closing lines of credit, lowering limits on credit cards, or a change in your payment history. This information is updated regularly, so scores can change within a short period of time. If you had a dramatic change in your score, you should order a credit report from the three major credit bureaus (annualcreditreport.com) and review the information there. A detailed explanation of how credit scores work and what affects them is found on our StreetWise Credit Score page. Why is my score so low? Along with your credit score, you may also receive the top two factors to help you better understand your credit score. You should focus on changing the behavior that caused these factors. Scores are affected by a wide variety of circumstances, including payment history, how much of your available credit you are using, and opening or closing accounts. A detailed explanation of how credit scores work and what affects them is found on our StreetWise Credit Score page. DCU has also partnered with a company called BALANCE which provides financial and credit counseling free of charge to our members. Their services are highly useful in many situations, including explaining credit report changes, and you can reach them at 888.456.2227. When are these scores updated? You will receive your FICO score on a monthly basis via Online Banking under Account Manager in your Inbox. The scores are updated once per month. No, this credit score can not be used for purposes of granting loans or any other consideration by DCU. This information is provided to you for personal use, simply to monitor your credit score and possibly the reasons why your credit score is what it is. This information is not a pre-approval. However, you can see if you are pre-approved within online banking. Look for the pre-approval banner just above your accounts page! You can then accept that pre-approval online in Online Banking, or call 800.328.8797, option 3 to speak to a loan representative. New pre-approvals are generated quarterly, so be sure to check back! How will this credit pull reflect on my credit report? Will it show as an inquiry? Please note that when we request your credit score for this product we are making what is referred to as a "soft inquiry." Soft inquiries may be recorded in your credit report, depending on the credit bureau, but they WILL NOT affect your credit score in any way. Why does DCU have this information without my permission? DCU will not request this information from Equifax until you "Opt-in" and agree to the terms of the Online Banking Credit Score Disclosure. For members who have opted-in, Equifax will deliver the score to Digital Federal Credit Union, who will post the FICO score and the 2 reason codes to the member's Online Banking page. How will DCU use this information? Will my information be sold? Will I now get junk emails from the credit bureaus? DCU does not use this information at all. It is provided solely to you for informational purposes. We do not and will not sell your personal information at any time, nor will you receive junk email from the credit bureaus. If additional products are purchased through Equifax directly, you will be subject to their policies regarding your information. What goes into determining my score? The majority of your score comes from your payment history and your ratio of used versus available credit. Low balances on cards with high limits are better for your score than those same balances on cards with lower limits. A detailed explanation of how credit scores work and what affects them is found on our StreetWise Credit Score page. How long does a delinquency stay on my credit report? Credit information stays on your reports for 7 years, but its importance lessens with age. A delinquent payment 6 years ago has far less impact on your score than one 6 months ago. Certain types of bankruptcies, however, can and do remain on your credit report for 10 years. How can I correct/dispute an error on my credit report? While nobody can remove accurate information from your credit report, you have the right to correct and dispute errors. If you believe your credit report contains an error, you should contact the applicable credit bureau directly. DCU cannot remove that information for you. How can my joint owners get their own score? Would they need their own membership and login? Joint owners will need their own membership and log-in to take advantage of the product. We encourage joint owners to join in their own right. The opt-out option is available within the credit score notification itself. Simply select that link and you will be removed from the program. DCU's Free FICO Score Product Terms and Conditions. StreetWise Credit Scores – Read about credit scores, why they are important to you, and how they are calculated. StreetWise Credit and Credit Management – This section of StreetWise talks about credit – how it works, how to use it responsibly, how to know if you are having difficulty with credit, and what to do if you are. BALANCE – DCU Members can get free unbiased financial advice and counseling through BALANCE. They provide many valuable services such as reviewing your credit report, working with creditors and helping you create an effective debt management plan.